Thanks for all the advertising of the extension. A lot of the features were created with the hope they could be integrated into the actual site. The appearance is an improvement. Larger avatars are nice. I can actually tell what they're supposed to be without the occasional need to go look at someone's profile in order to find out. Links to posts are still not going to posts, but to the top of the page on which a given post is. The tab up there still says nothing but "Arc Games," which means keeping multiple tabs open in the same browser does not let me see by mousing over which one is to which thread. This also affects bookmarks. Those few bookmarks I have added since the forced redirect into frames now all read the same thing in my bookmarks folders: "Arc Games." That's really not helpful when I'm trying to find a particular thread. 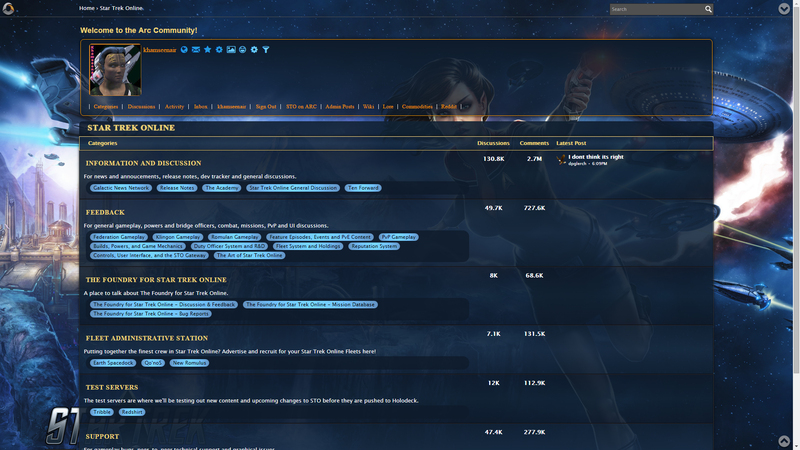 We still don't have the forum titles we paid for. I note that the language filter has improved ever so slightly. Can I still not say the word crap? Edit: Yeah, I still cannot say c r a p . Oh, the joys of language filters made by non-native speakers. Edit 2: And so it did. This second edit should make it once more invisible, if things are still like they were with the filter. Edit 3: Well, the second edit didn't. This one may or may not. But it shouldn't have been censored in the first place. I personally like the changes since it makes things a lot more readable. However, if there are other changes that you'd like to see, please feel free to let us know. See my previous comments below. 1. It's good that you will be adding page numbers to the bottom, but there is another problem that you haven't considered. On the first page, the page numbers appear below the first post, which can sometimes be quite long. I think the page numbers should appear above the first post. 4. I can't delete my notifications. 5. You should restore the option to view drafts. Also, is anyone working on the SSL problems with the main site arcgames.com? The problems affect anyone trying to establish a secure connection to arcgames.com using Firefox (and possibly some other browsers), whether it be for billing, customer support, or to post on the forums. 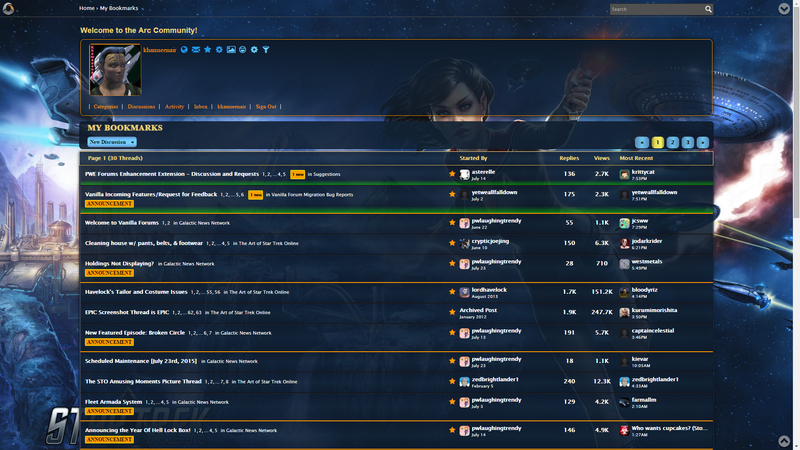 The problems do not lie with Vanilla Forums, but with arcgames.com itself. Yeah, I'm undoing a lot of those tweaks already. They've been far more readable to me for weeks now. Infinite possibilities have implications that could not be completely understood if you turned this entire universe into a giant supercomputer. You guys should check out the enhancement script for some ideas. 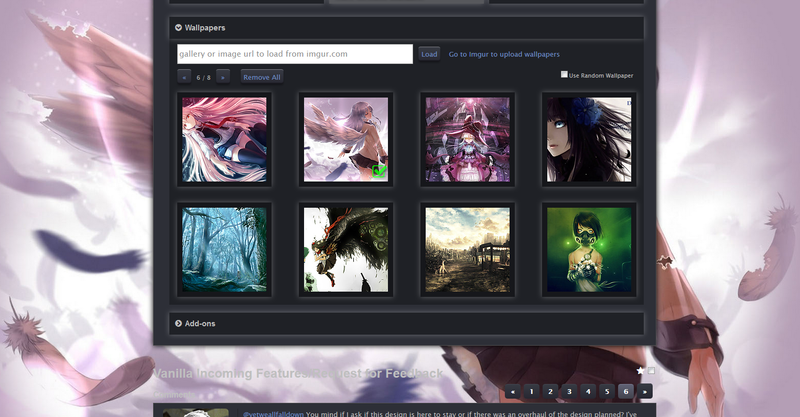 There are a lot of very nice user created themes in there, even if I do say so myself haha. soo, is thisworking as intended? when i click on "next page" at the bottom now, i get to the next page but im still stuck at the bottom!? shouldn't it put you on the TOP of the next page? You are correct. Page numbers not existing at the bottom was a problem. Thanks to The Mighty Trendy for fixing that problem of non-existence. Because not having page numbers at the bottom of the page was indeed a problem for many of us, whether it was one of your concerns or not. I haven't had that experience, and I thought that might be because I click the number instead of "next." But nope, having just tested the next page button, it took me to the top of the next page. That certainly does happen, and has been happening since the forced redirect into frames. @protogoth tehbubbaloo was talking about the size tag being disabled (I think). I have hidden every category except for this one and the ones for PWI, yet when I search for discussions I am getting a laundry list of discussions from the lower depths of neverwinter. Apparently this category is immune to the hide function even thought it has been hidden. How do I fix this? 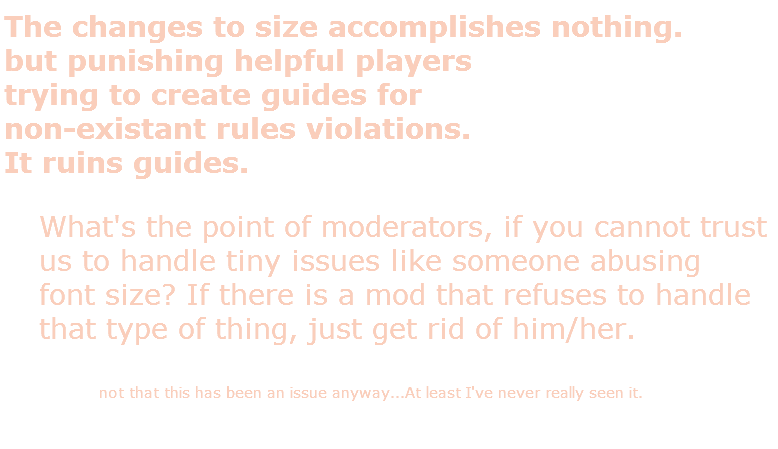 I appreciated thechanges that have happened in the Vanilla Forums lately. Easier to read. The search function is now my "friend". I just want to acknowledge the positive changes and say thanks. Regarding the issue of being thrown to the bottom of the page upon clicking on 'next page' or the next number of a page (yes, I do have that issue), I don't think I've encountered it while the forum was accessible directly at vanillaforums. Now that I'm automatically redirected to arcgames.com, there seem to be several page positionment issues. In addition to the one listed, I'm also not sent directly to the post I click the date for. Instead I get sent to the top of the page containing the post. Then there's the obvious annoyance of the arc bar taking space at the top of the page and the additional time it takes to load. I don't think I've encountered it while the forum was accessible directly at vanillaforums. Evidently, someone is trying to do something, because I've been getting redirects to the base Arcgames Forum page when refreshing or opening new tabs since this morning. Second attempts generally do what I want, but the failure of the first attempts is rather annoying (and uses up some of the data in my limited data package, much like the forced redirect into frames ...). And before anyone says "I fixed that in my add-on," that's great and all, but PWE/Arc/Vanilla needs to fix the fora so we don't have to use external fixes. My avatar picture refuses to remove. I click my name at the top then the Preferences button. Then 'Change my picture'. I click the 'Remove' button under my avatar pick and get a confirmation pop up asking if I'm sure I want to do that and select 'Okay'. The page then instantly refreshes and the image is still there. I was able to change my picture though. 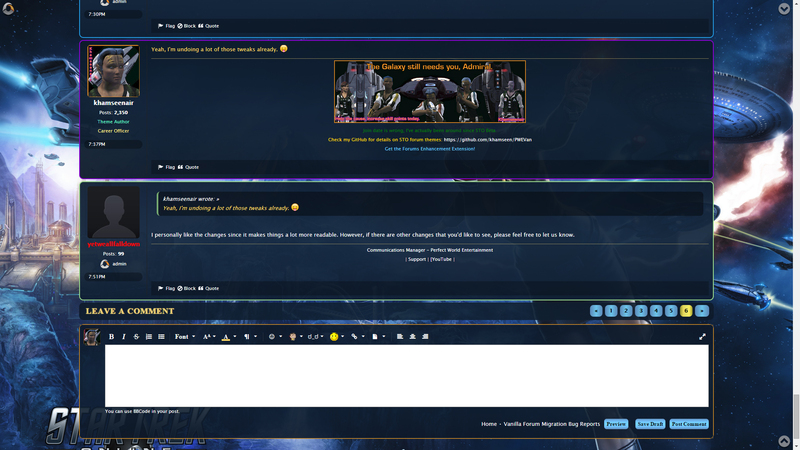 the problem is that they want very badly to incorporate the forum account with the pwe account, but dont seem to have anyone available (or permitted) to make it happen properly.